​Armed with material from their eagerly anticipated third album, Limitless, Australian rock heavyweights Tonight Alive are set to play a run of intimate east coast shows in January, before embarking on European and US dates. A little bit older and a whole world wiser, today Tonight Alive are a band brimming with energy onstage and off – bursting with stories from the road and with a lust for life that overflows into their lyrics, music and explosive live shows. Starting the tour at Max Watt’s in Melbourne, before heading to Brisbane and Sydney where they will play all ages shows, Tonight Alive will be showcasing material from the new album Limitless which is set for release on Friday 4th March 2016. Limitless was recorded and mixed at The House Of Loud in New Jersey and produced by the renowned David Bendeth (Breaking Benjamin, Paramore, Bring Me The Horizon), and is the follow up to their 2013 album The Other Side, which debuted at #5 on the ARIA Album Chart. 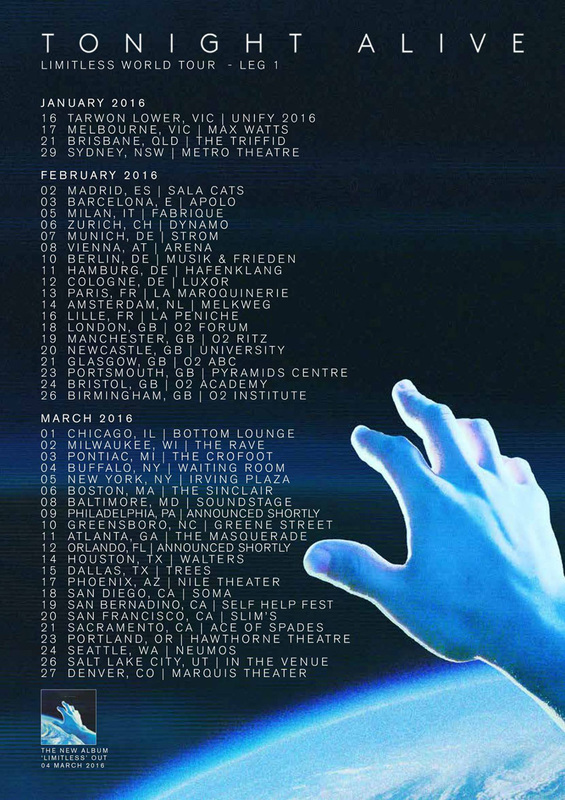 To celebrate the album release, the band will embark on these east coast dates in January 2016, followed by European and US dates throughout February and March. As Tonight Alive front woman Jenna McDougall explains, “Limitless is a record that is just as much about redefining boundaries as it is about challenging the illusory concept of boundaries itself. Our mission in both the song writing and recording process was to dissolve all restriction and repression of the mental, physical and spiritual; and grant ourselves an opportunity to be expressive at our highest capacity. “Following an emotional reaction to our second record The Other Side and the healing of its touring cycle, we found the clarity to explore a newfound, centred version of ourselves where creating something meaningful and everlasting was of the highest importance. ”We tore away every formula, structure and safety net we knew to embrace a complete unlearning and evolution. This record shares our journey of harnessing personal power and acts as the long awaited answer to the questions of our previous records.” - Jenna McDougall, Tonight Alive. Tonight Alive has this morning also revealed the first taste of the album in the form of Human Interaction.